Delicious, tart berries that are the first to ripen in the spring, strawberries are every person’s delight. Tasty, healthy, juicy and luscious, these pretty little berries are even enough to satisfy your insatiable sweet tooth. But have you ever used them as a fruity delight for your skin and hair? Try it, and you will be amazed. Bursting with vitamins and powerful antioxidants, strawberries do a lot more than just please your taste buds. 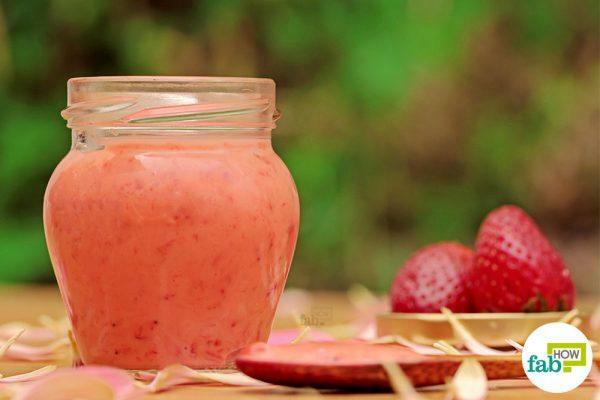 Rich in flavonoids and salicylic acid, strawberries provide many healthful benefits. 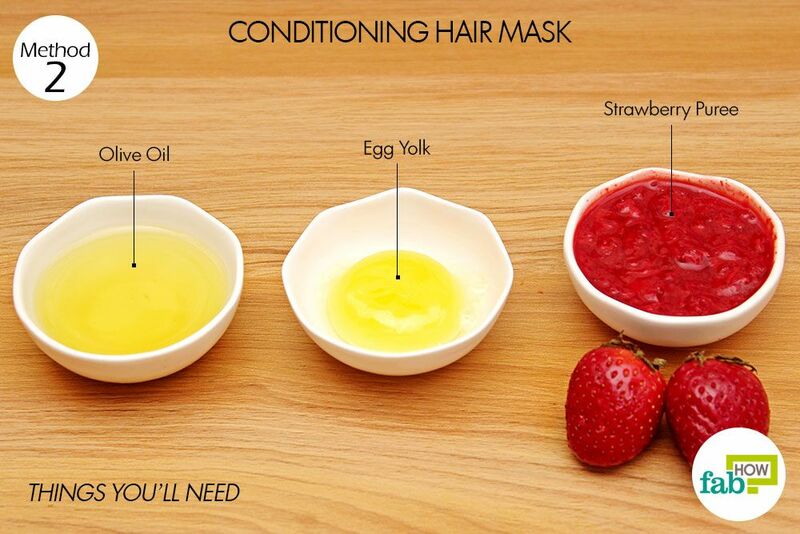 You can use strawberries to enhance healthy skin and gorgeous hair. 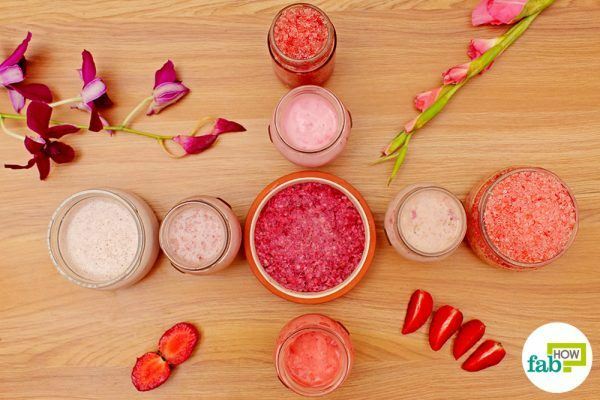 Strawberries have much to offer – they clear up acne, reduce under-eye puffiness, make skin appear younger and smoother, whiten teeth, leave hair shiny and well-conditioned, and so much more! What Makes Them So Good for Skin? Vitamin C: Strawberries are loaded with vitamin C that fights off free radicals that steal oxygen from healthy cells and damage collagen, thus causing fine lines and wrinkles on your skin. Folic acid: Strawberries are rich in folic acid, which stimulates cell regeneration and aids in new cell formation in the skin. 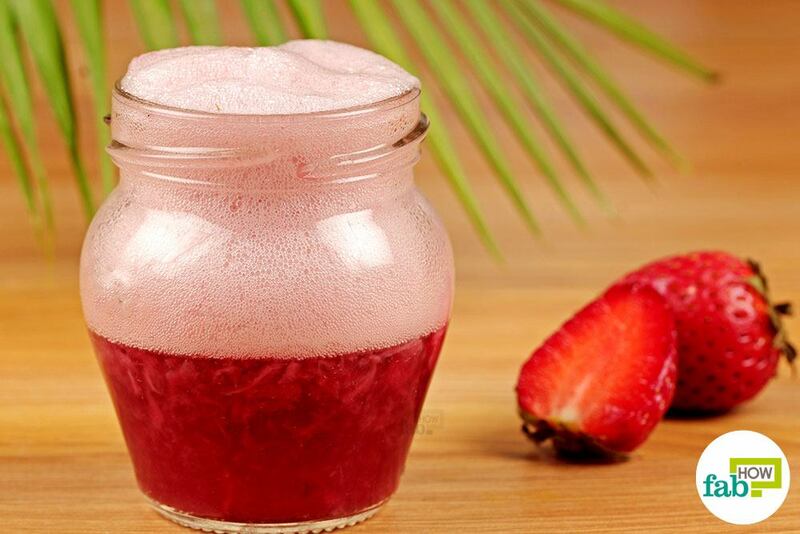 Ellagic acid and antioxidants: Strawberries contain ellagic acid and numerous antioxidants that help reduce blemishes and scars, and protect the skin from harmful rays of the sun. Moreover, strawberries contain alpha-hydroxy acid, an important substance that eliminates dead skin cells while cleansing them. As the fruit is incredibly good for the skin, it is exceptionally good for softening, nourishing and conditioning your hair as well. Here are ways you can incorporate strawberries into your daily beauty regime for healthy hair and gorgeous skin. Strawberries contain vitamin C and other antioxidants that prevent damage to the skin and the body caused by free radicals. Vitamin C also inhibits the aging process of the skin as a result of the effects of free radicals. Strawberries also contain lycopene, a compound that prevents signs of aging skin. Bananas, on the other hand, are filled with potassium, antioxidants and have anti-inflammatory properties that contribute to the good health of your skin. Grab a ripe banana and mash it in a small bowl. 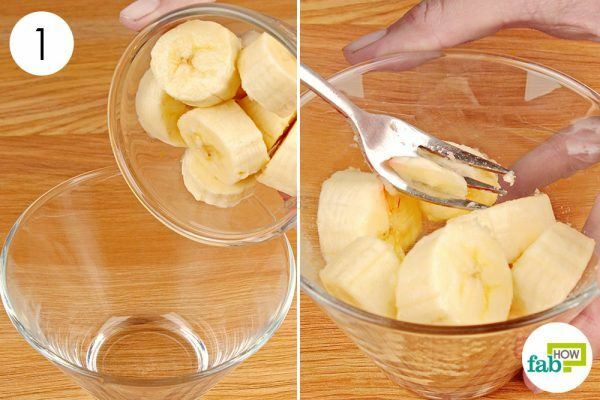 Put the mashed banana into a mixing bowl. Blend 1 tablespoon of honey and 1 tablespoon of whipped cream into the banana-strawberry mixture. Store in a container for future use. 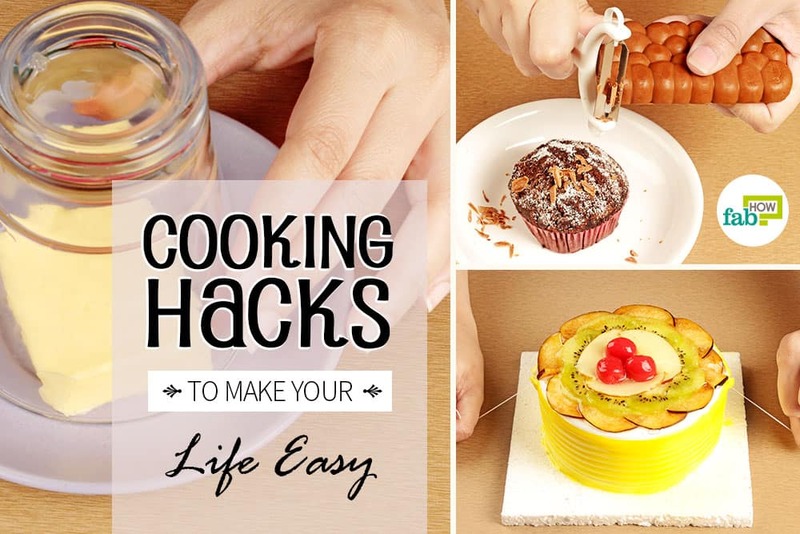 Leave it on for 20 to 30 minutes, or until it completely dries, whichever happens first. Wash off with water and pat dry your skin. Repeat twice weekly for soft and supple skin free of wrinkles and fine lines. Strawberries contain ellagic acid that helps to reduce fine lines and wrinkles while boosting the production of collagen in the skin. 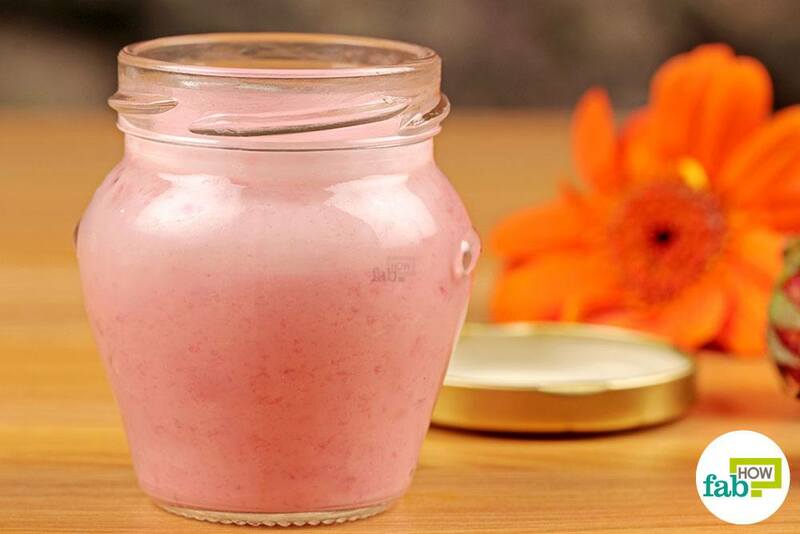 The acidic and abrasive nature of strawberries helps to remove excess sebum from the skin. Honey works as a natural humectant to soothe and soften your skin. Yogurt contains antibacterial, antifungal and cleansing properties that help to extract dirt and impurities from your clogged pores. 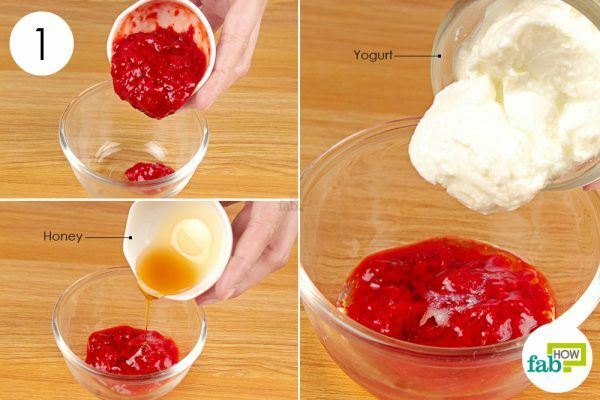 Put 2-3 pureed strawberries in a bowl. 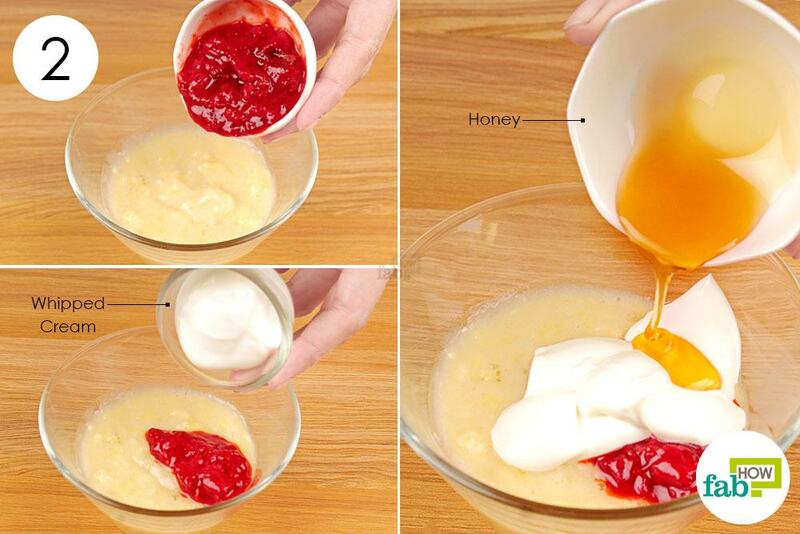 Add 2 tablespoons of yogurt and 2 teaspoons of honey to the mix. 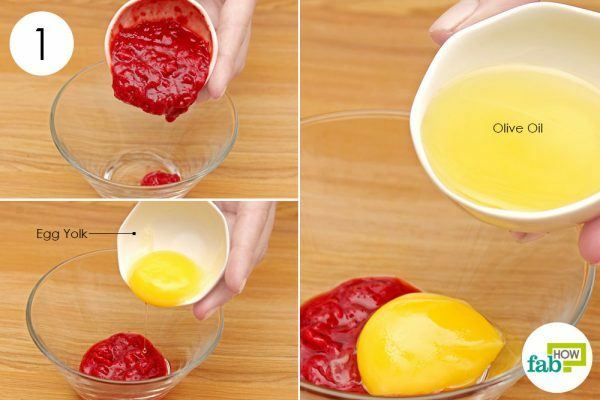 Combine the ingredients well to get a smooth paste. Apply evenly on your clean face and neck, carefully avoiding the eye area. Leave the mask on for 20 minutes, or until it dries completely, whichever comes first. Wash it off using cold water and pat your skin dry. 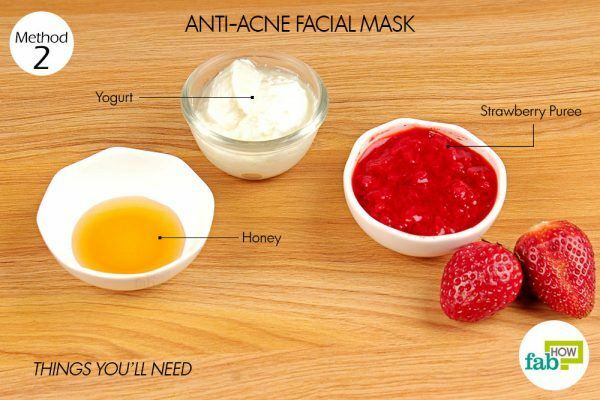 Use this twice every week for acne-free skin. Strawberries can be effective in giving you soft and crack-free feet. The mild abrasive property of strawberries helps to exfoliate the skin. Oatmeal, a gentle exfoliate, removes dirt, impurities and dead skin cells from the skin while it soaks up excess oil and sebum. Pour the pureed strawberries into a bowl. 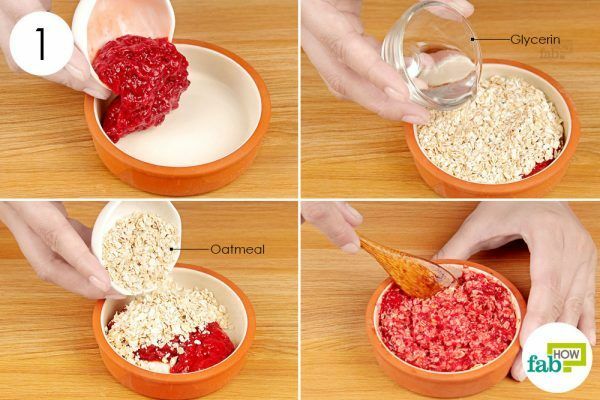 Add 2 tablespoons of ground oatmeal to the puree. 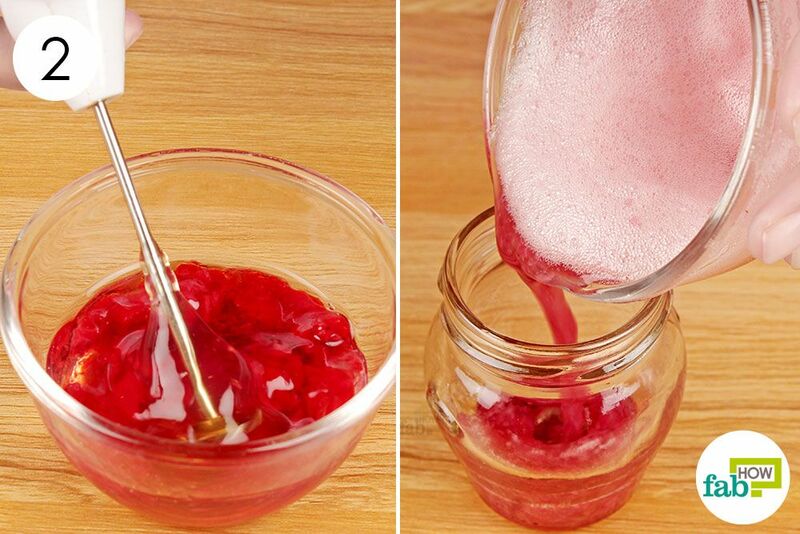 Blend 2 teaspoons of glycerin into the mixture. 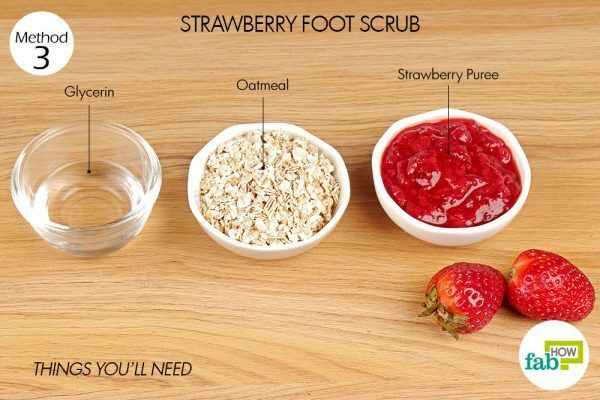 Take your feet out of the water and gently scrub with the mixture. 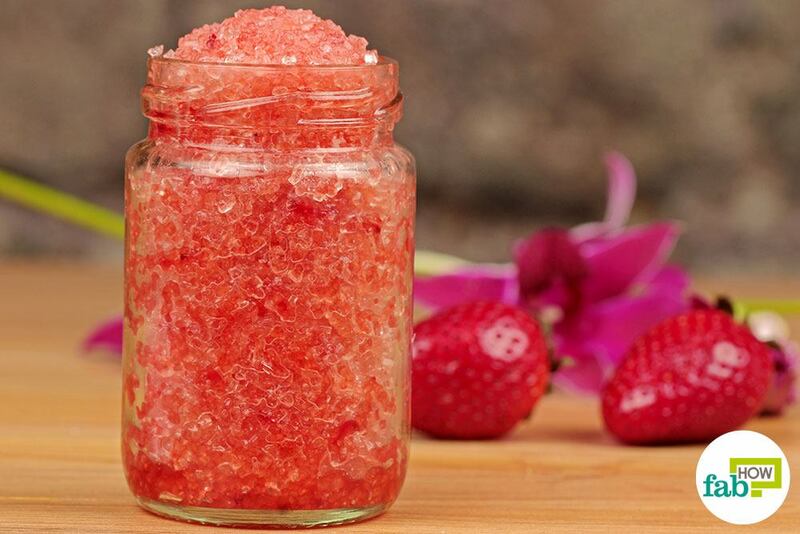 Scrub for 5 to 7 minutes to exfoliate dead skin cells and rough skin. Wash your feet with cold water. Finish with a moisturizer or a cold cream. Repeat 2 times a week for soft and smooth feet. Take 1/4 cup of Epsom salt in a bowl. Add 2 tablespoons of mashed strawberries. 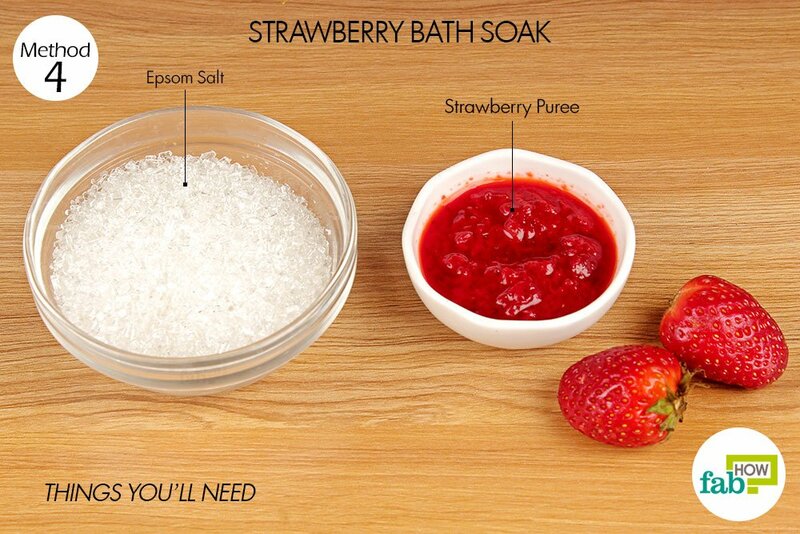 Add the desired amount (about 2 tablespoons) to your bathwater. Soak yourself in the bath for 15 to 20 minutes. You can use this every day for an aromatic and refreshing experience. You can store the mixture in the refrigerator for about 1 week. 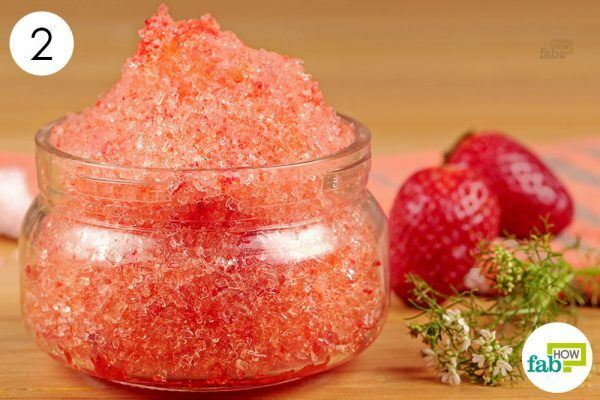 Strawberries are mildly abrasive in nature which makes it an effective exfoliating agent to remove dirt and other impurities from the skin. Egg whites help tighten and lift your skin, making your pores appear smaller. 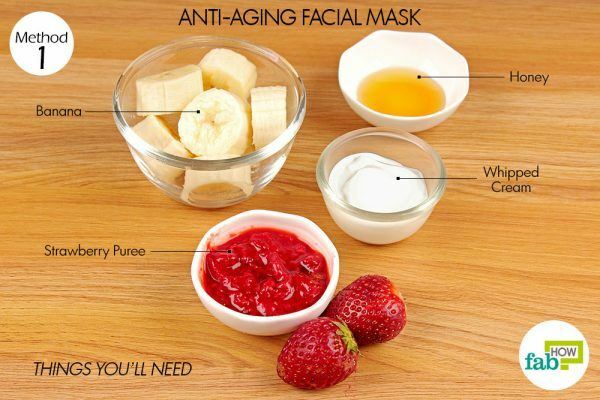 It also helps clear away dead skin cells and helps prevent breakouts. 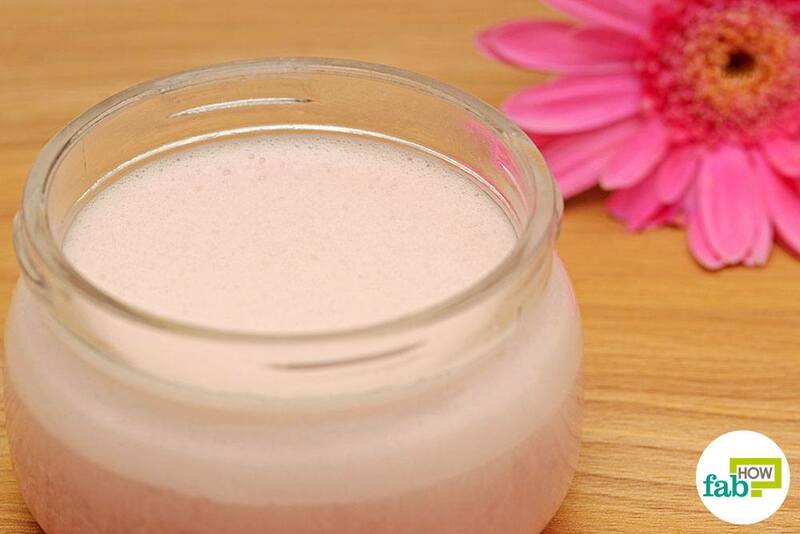 Honey is easily absorbed into the skin and works to soften and smoothen your skin. 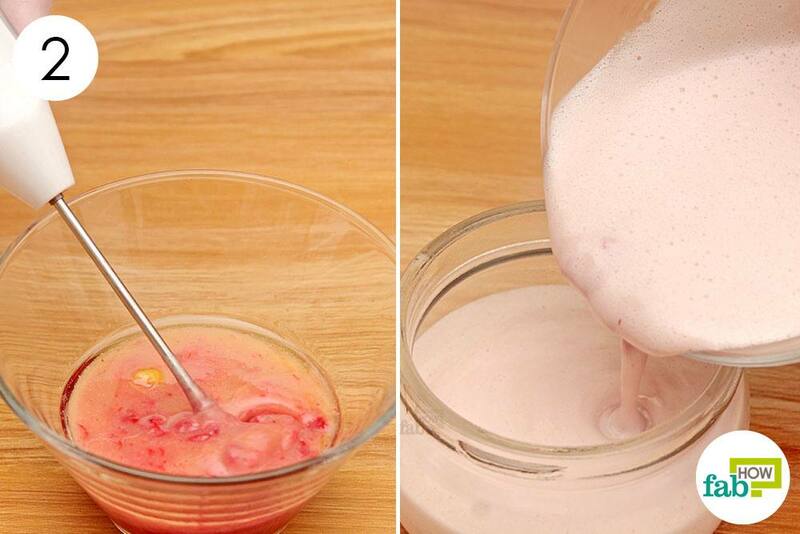 Take 2 pureed strawberries in a bowl. Add 1 teaspoon of honey and 1 egg white. Mix the ingredients well to form a smooth and uniform mixture. 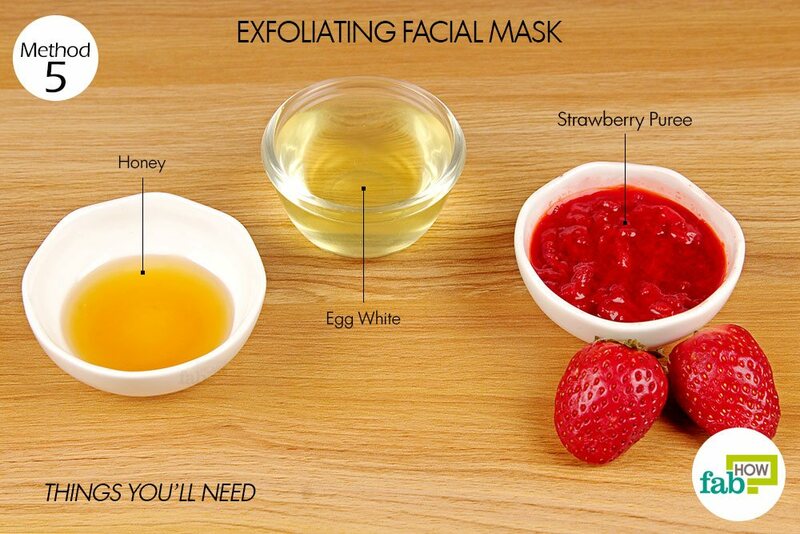 Slather the mask gently and evenly on your clean face and neck. Wash off with alternating cold and warm water, finishing with a splash of cold water. Repeat the process 2 or 3 times each week to slough off the dead cells and cleanse your pores. Strawberries contain salicylic acid that helps to remove dead cells from the skin and clears up blemishes. 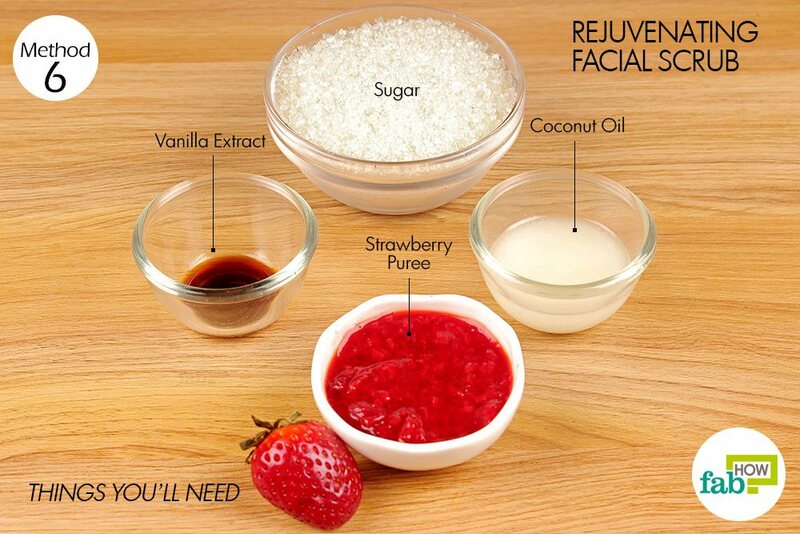 Sugar is excellent for exfoliation as it removes trapped dirt and impurities from the skin. Coconut oil is rich in antioxidants that prevent free radicals from harming the skin and causing it to lose its elasticity. 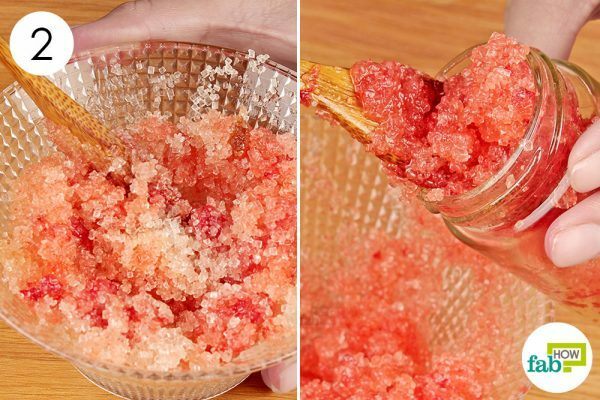 Put 1/2 cup of sugar in a bowl. 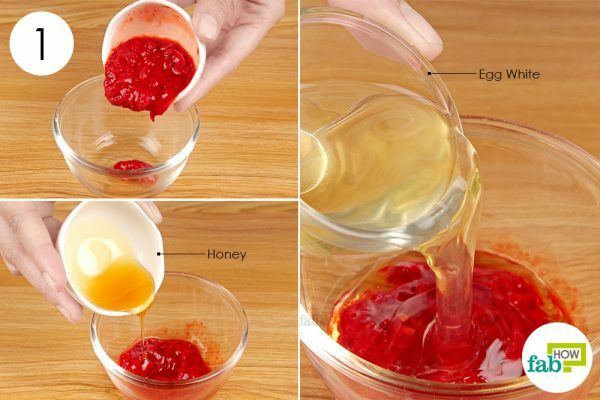 Add the strawberry puree to the sugar. Add 2 tablespoons of coconut oil and 1 tablespoon of vanilla extract. Stir the mixture so that the ingredients are combined well. Store it for further use. 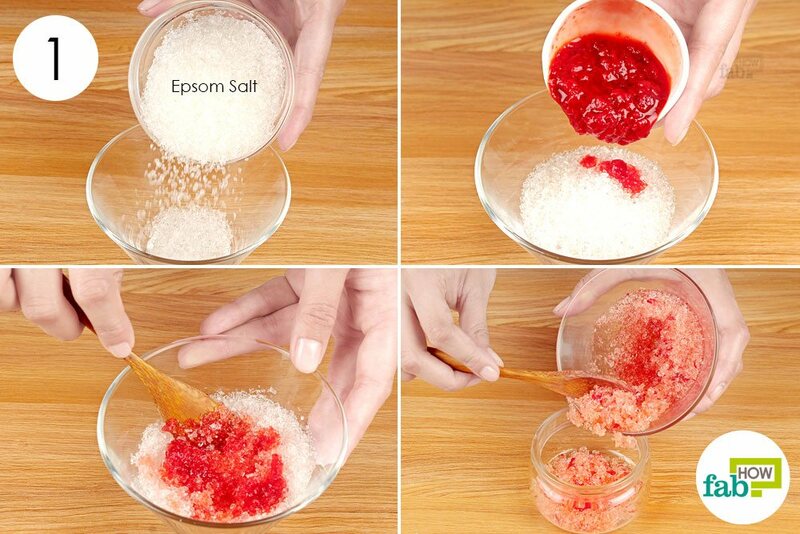 Take a small amount on your palm and gently scrub your face and neck with the mixture. Repeat twice every week for a smooth and soft skin. 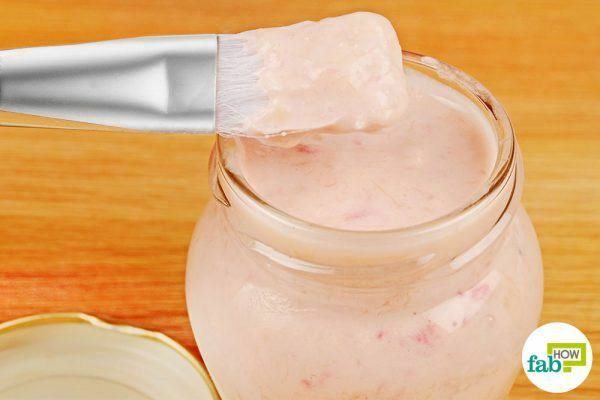 Mayonnaise contains several oils that nourish and moisturize your hair from deep within, while also restoring a healthy pH balance of your hair. A strawberry-mayonnaise blend works incredibly well to soften, nourish and moisturize your hair. Mash and puree 2 or 3 ripe strawberries. 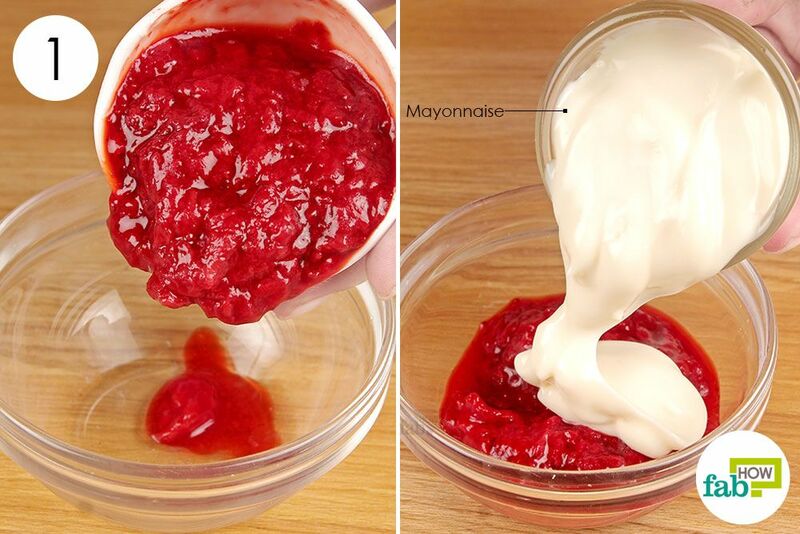 Add 2 tablespoons of mayonnaise to the puree. Whisk thoroughly so that the ingredients combine well into each other. 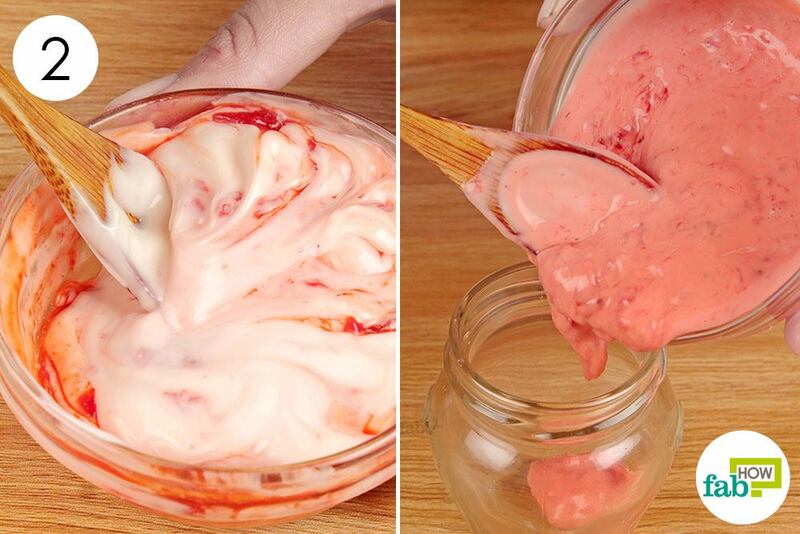 Massage the paste into damp hair. Cover with a shower cap and allow it to set for 15 minutes. Shampoo and condition as you normally would. Repeat the process once every week for glossy and shiny hair. Strawberries contain vitamin C, a nutrient that encourages the absorption of iron to promote hair growth. They are also loaded with silica, a substance that helps to prevent balding and contributes to hair growth. Olive oil, a natural moisturizer. It contains lipids that have incredible hair softening qualities. 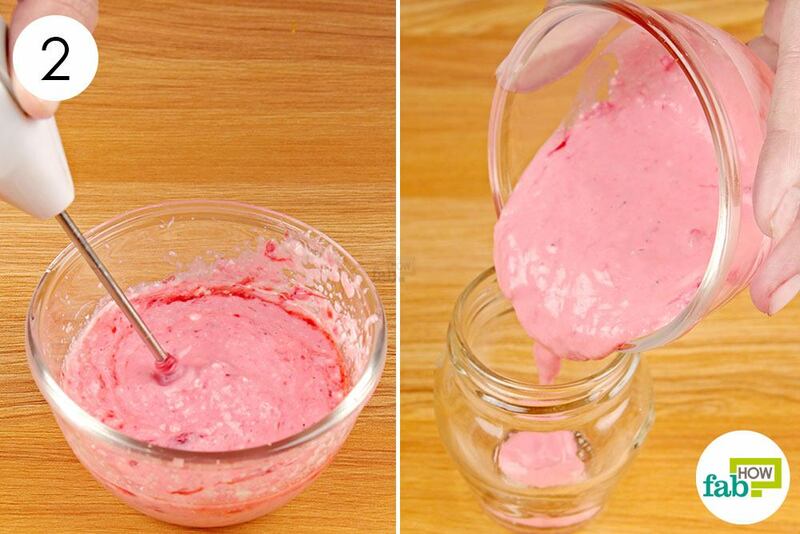 Take 2-3 pureed strawberries in a bowl. Blend 1 egg yolk with the puree. Add 2 tablespoons of olive oil to the blend. 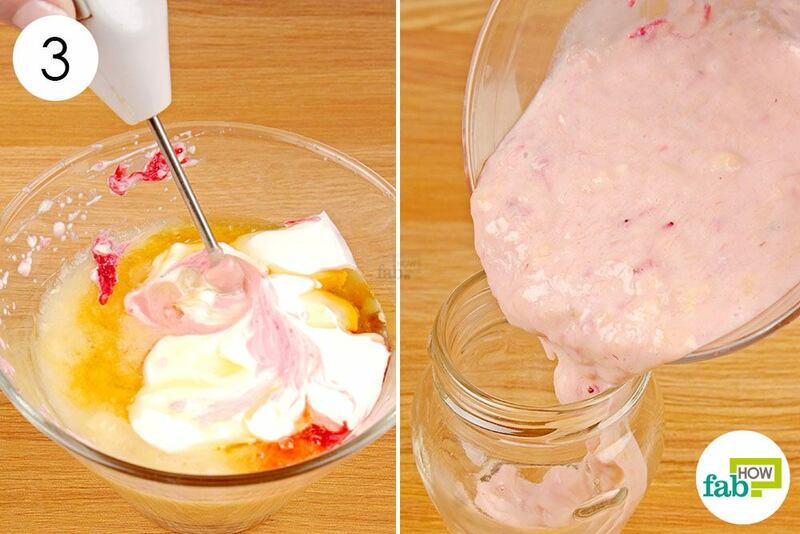 Whisk the ingredients together to combine them well. 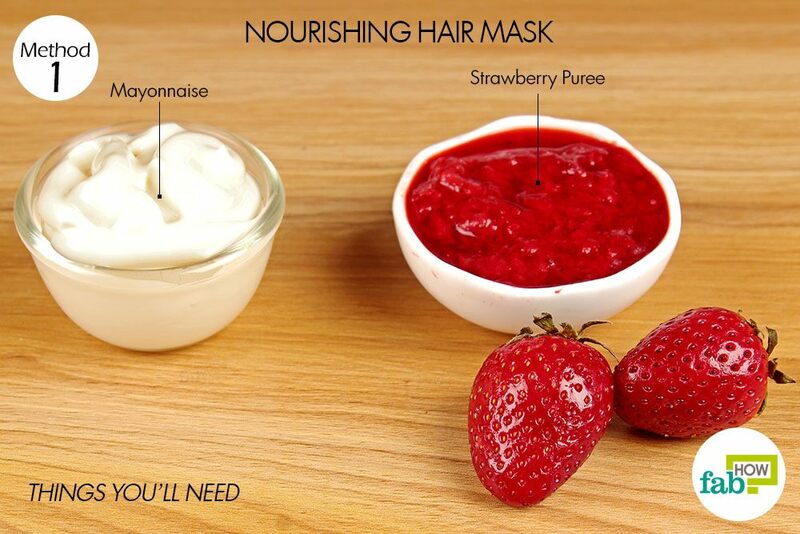 Work the mask into your hair. Cover your hair with a plastic shower cap. Leave it in for 20 to 30 minutes before rinsing it out with cold water. Apply your favorite conditioner and leave in for 5 minutes. Rinse the conditioner out and then shampoo normally. 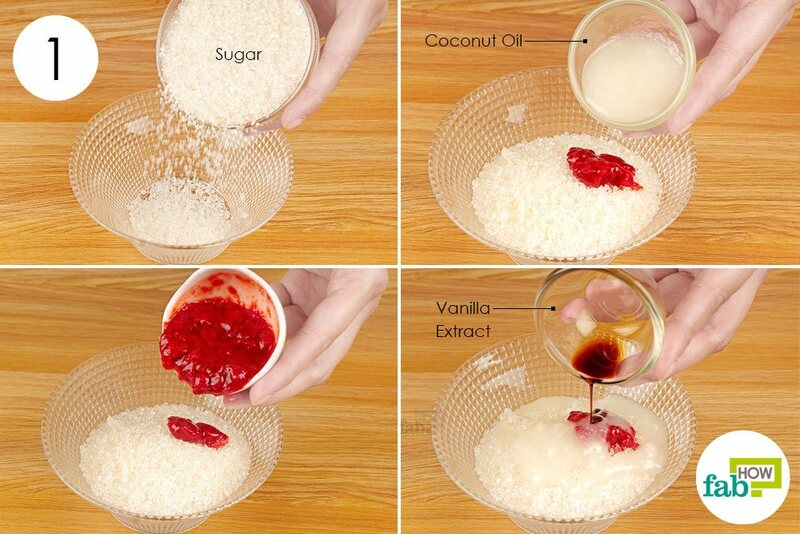 Do this once a week for soft, shiny and glossy hair. Do not use the above remedies in your skin care regime if you are allergic to strawberries, or any other ingredients. Use the above remedies when you have enough time to spare. Strawberry along with other ingredients can get super sticky, so rinsing out a strawberry mixture may be a tough task. 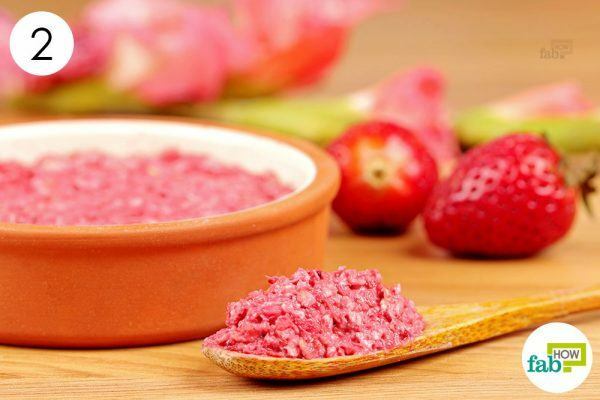 When well pureed, it may not take as long, but it might take a few rinses to remove fully. Strawberries are also rich in biotin that helps strengthen weak nails.